CORVALLIS, Ore. – For a hedge, arborvitae has a place. It’s tall, skinny, evergreen, low-maintenance and cheap. When finding a location for arborvitae in the garden, Bell recommends full sun and well-drained soil. Arborvitae also need well-drained soil. If you have boggy soil, they won’t survive. Bell strongly suggests dealing with drainage problems before planting your arborvitae. Sometimes digging in organic material will do the trick, but for serious situations it may be necessary to install drainage tiles. The flip side of that is the damage incurred during increasingly hot and dry summers. Bell points to how some arborvitaes exhibited signs of dieback after the drought of 2015. Though many people think trees don’t need to be watered, it’s essential to give them a good soaking every two to three weeks during dry periods to be on the safe side. What you shouldn’t do is prune the tree back to bare stems. Unlike laurel hedges that like to be cut back with abandon, arborvitae won’t produce new growth if pruned hard. They do, however, respond well to light pruning any time of year if necessary, to keep them shaped. 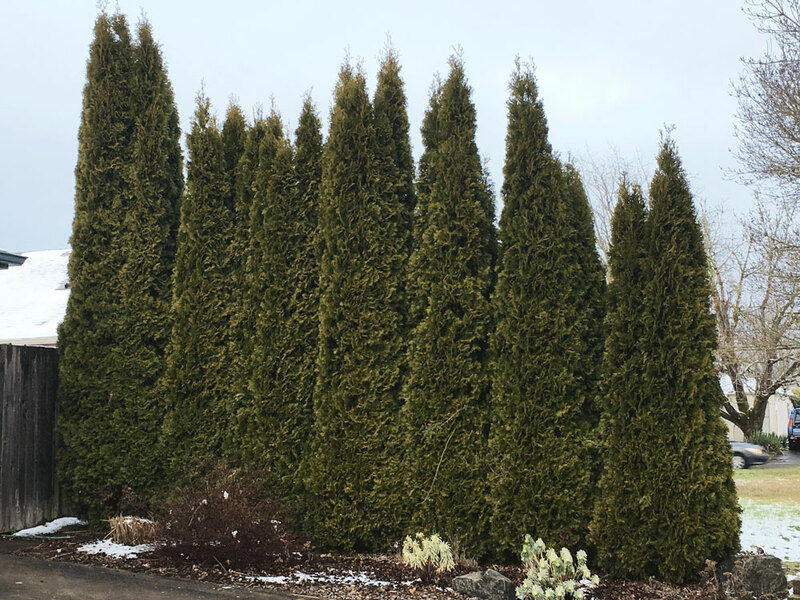 The most commonly found arborvitae (Thuja occidentalis) in the Northwest is ‘Emerald Green,’ also known as ‘Smaragd, which gets about 15 feet tall by 4 feet wide. When shopping, look for healthy plants that are relatively the same size. You’ll find them in containers or balled and burlapped. Plant arborvitae like any other tree, a process that has changed over the years. Dig a hole that’s twice as wide as the root ball and just deep enough so that the top sits 1 to 2 inches above ground. A good resource for complete instructions is Selecting, Planting, and Caring for a New Tree by OSU Extension. Space trees 3 to 4 feet apart. Some cultivars of arborvitae will turn a washed-out brown in winter, though the most ubiquitous ‘Emerald Green’ doesn’t have that characteristic. In those instances, all the foliage will brown up. Drought stress, on the other hand, will show up intermittently on individual trees and may not show up in every tree in the hedge. Arborvitae are sturdy plants and have very few pest problems. The exception is mites, but even those are very uncommon, according to Bell. A grayish cast to the foliage is an indication there are mites on your tree. The deer feed from the bottom 4 to 5 feet and some people don’t mind. It depends on what you’re willing to tolerate. You can try repellents, but there’s no scientific evidence that they work and they need to be reapplied often. The alternative is a fence – either around your entire yard or around the hedge. If you get snow in winter, it’s a good idea to tie up the top of your arborvitaes or they could split. If you have an arborvitae in decline, be sure to determine why it died before replacing it and then buy the largest plant you can find so it catches up to it neighbors as quickly as possible. For help figuring out the problem, contact the OSU Extension Master Gardeners in your county. The bottom line, Bell said, is to plant arborvitaes in full sun with good drainage and they should perform well for many years. About the OSU Extension Service: The Oregon State University Extension Service shares research-based knowledge with people and communities in Oregon’s 36 counties. OSU Extension addresses issues that matter to urban and rural Oregonians. OSU Extension’s partnerships and programs contribute to a healthy, prosperous and sustainable future for Oregon.